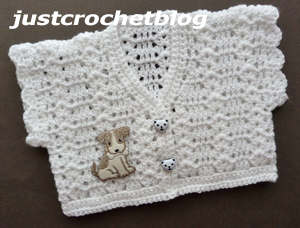 Crochet girls short cardigan uk a free crochet pattern for a 20″ chest 6-12 month baby, made in UK double knitting yarn on a 4.50mm crochet hook. tr2tog. Leaving last loop of each tr on hook, work 1tr into each of next 2tr, yrh and draw through all loops. 2nd Row – 3ch, * miss 2tr, 1 shell into 1ch space of next shell, miss 2tr, 1tr into each of next 3tr, * rpt from * to * to last shell, miss 2tr, 1 shell into 1ch space of shell, miss 2tr, 1tr into top of 3ch. Turn. 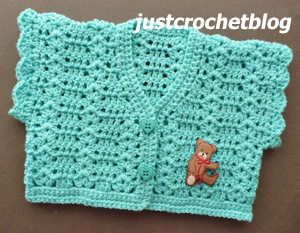 Rpt 2nd Row until 6 rows have been worked in all. First Front – 3ch, miss 2tr, work 2tr into 1ch space on next shell, * miss 2tr, 1tr into each of next 3tr, miss 2tr, 1 shell into 1ch space on next shell, * rpt from * to * once, miss 2tr, 2tr into next tr, turn leaving remaining 9 shells un-worked. 8th Row – 3ch, 1tr into next tr, * miss 2tr, 1 shell into 1ch space of next shell, miss 2tr, 1tr into each of next 3tr, * rpt from * to * once, tr2tog (see abbrev) over next 2tr, 1tr into top of 3ch. Turn. 9th Row – 3ch, tr2tog over next 2tr, 1tr into each of next 2tr, miss 2tr, 1 shell into 1ch space of next shell, miss 2tr, 1tr into each of next 3tr, miss 2tr, 1 shell into 1ch space of next shell, miss 2tr, 1tr into next tr, 1tr into top of 3ch. Turn. 10th Row – 3ch, 1tr into next tr, miss 2tr, 1 shell into 1ch space of next shell, miss 2tr, 1tr into each of next 3tr, miss 2tr, 1 shell into 1ch space of next shell, miss 2tr, 1tr into next tr, tr2tog over next 2tr, 1tr into top of 3ch. Turn. 11th Row – 3ch, tr2tog over next 2tr, miss 2tr, 1 shell into 1ch space of next shell, miss 2tr, 1tr into each of next 3tr, miss 2tr, 1 shell into 1ch space of next shell, miss 2tr, 1tr into next tr, 1tr into top of 3ch. Turn. 12th Row – 3ch, 1tr into next tr, miss 2tr, 1 shell into 1ch space of next shell, miss 2tr, 1tr into each of next 3tr, miss 2tr, 1 shell into 1ch space of next shell, miss 2tr, 1tr into next tr, 1tr into top of 3ch. Turn. Rpt 12th Row 3 more times. Fasten off. Next Row – 3ch, 1tr into next tr, * miss 2tr, 1 shell into 1ch space of next shell, miss 2tr, 1tr into each of next 3tr, * rpt from * to * to last shell, miss 2tr, 1 shell into 1ch space of next shell, miss 2tr, 1tr into last tr, 1tr into top of 3ch. Rpt last row 7 more times. Fasten off. Second Front – With RS facing return to un-worked stitches, miss 1tr, join yarn to next tr, work 3ch, 1tr into base of 3ch, * miss 2tr, 1 shell into 1ch space of next shell, miss 2tr, 1tr into each of next 3tr, * rpt from * to * once, miss 2tr, work 2tr into 1ch space of next shell, 1tr into top of 3ch. Turn. Row 8 – 3ch, tr2tog over next 2tr, 1tr into each of next 3tr, * miss 2tr, 1 shell into 1ch space of next shell, miss 2tr, 1tr into each of next 3tr, miss 2tr, 1 shell into 1ch space of next shell, miss 2tr, 1tr into next tr, 1tr into top of 3ch. Turn. Row 9 – 3ch, 1tr into next tr, miss 2tr, 1 shell into 1ch space of next shell, miss 2tr, 1tr into each of next 3tr, miss 2tr, 1 shell into 1ch space of next shell, miss 2tr, 1tr into each of next 2tr, tr2tog over next 2tr, 1tr into top of 3ch. Turn. Row 10 – 3ch, tr2tog over next 2tr, 1tr into next tr, miss 2tr, 1 shell into 1ch space of next shell, miss 2tr, 1tr into each of next 3tr, miss 2tr, 1 shell into 1ch space of next shell, miss 2tr, 1tr into next tr, 1tr into top of 3ch. Turn. Row 11 – 3ch, 1tr into next tr, miss 2tr, 1 shell into 1ch space of next shell, miss 2tr, 1tr into each of next 3tr, miss 2tr, 1 shell into 1ch space of next shell, miss 2tr, tr2tog over next 2tr, 1tr into top of 3ch. Turn. Row 12 – 3ch, 1tr into next tr, miss 2tr, 1 shell into 1ch space of next shell, miss 2tr, 1tr into each of next 3tr, miss 2tr, 1 shell into 1ch space of next shell, miss 2tr, 1tr into next tr, 1tr into top of 3ch. Turn. Rpt Row 12 three more times. Fasten off. Whip stitch shoulder seams together. Border & buttonholes – With WS of work facing, working along starting chain edge, join yarn to 3rd of the 5ch, work 1ch, 1dc into base of 1ch, 1dc into each ch to end, 3dc into corner, working along first front edge, work 13dc evenly into row ends, 2dc into next row end, 16dc evenly into row ends up first side of V neck, then (missing 1ch spaces) work 1dc into each of next 13tr across back of cardi, 16dc evenly into row ends down second side of V neck, 2dc into next row end, work 13dc evenly into row ends to corner, 1dc into corner, ss to first dc on beginning of row. Turn. Buttonhole Row – 1ch, 1dc into base of 1ch, 1dc into each of next 4dc, make 2ch, miss 1dc, 1dc into each of next 6dc, make 2ch, miss 1dc, 1dc into each of next 3dc, 2dc into next, 1dc into each dc up first side of V neck, around the back and down second side of V neck, 2dc into next dc, 1dc into each dc to corner, 3dc into corner, 1dc into each dc along bottom of cardi, 1dc into corner, ss to first dc on beginning of row. Turn. Starting with 1ch, 1dc into base of 1ch, work one more row of 1dc into each dc and 2ch space to end, ss to first dc on beginning of row. Fasten off. 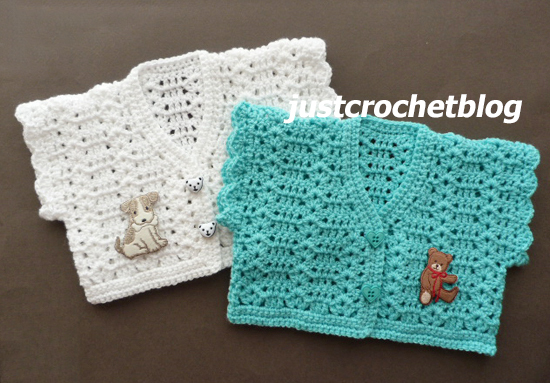 Hope you enjoy this free crochet girls short cardigan uk pattern, don’t forget to pin!